Groovy Monday seems to have arrived very fast. Five mums shared their thoughts on taking positive steps to change their lives last week. Do check out their stories and leave a supportive comment – that’s how Groovy Mums works best. I have looked at the 5 ways to well being and can report as follows. 1. Connect – I have looked the world in the eye more especially on the school run where I find cliques very intimidating. I have managed to chat and laugh a little with mums. For me, this is very groovy. 2. Be active – I am incorporating more walking into my day. I also tried a little yoga at the weekend. I am going to commit to doing some exercise straight after the school run every day. I think that will work best. 3. Take notice – It is vital to count our blessings. I have tried to savour moments more particularly cuddles with the children. 4. Keep learning – I have not done enough on this front. I need to read more and to write more. As a wonderful woman told me even putting 20 minutes aside a day to write that novel could pay dividends in the long-term. 5. Give – I have a very groovy giveaway for you this week in association with the British Heart Foundation. It will appear today or tomorrow at the latest. So my groovy challenges for you this week are ..
3. Savour the moment letting go or what was or what might be. 5. Enter my Groovy Giveaway and Ramp Up the Red. Blog about how you are taking steps to change your life for the better in ways large or small and link up. Visit the other entries on the linky and offer your support. In other news, my husband has a job offer that might take us in a very groovy direction indeed. I sense we are at a very interesting crossroads right now. The connecting is resonating for me. I find it all to easy to limit my connecting to keyboard stuff, because it’s easier than actual talking. 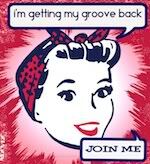 Pingback: Getting my groove back | Under The Kitchen Table. Took the plunge and jumped on the groovy mums bandwagon . I agree about the connecting thing. I’ve realised that I’m more at home in front of a computer than with actual people so have done something very groovy this week to change that.